For other places to visit, photos, traveler tips, and other tourist information, read Keystone trip planning tool . Great Bend to Keystone is an approximately 8.5-hour flight. You can also drive. Traveling from Great Bend to Keystone, you'll gain 1 hour due to the time zone difference. Expect a bit cooler temperatures when traveling from Great Bend in July; daily highs in Keystone reach 80°F and lows reach 53°F. Cap off your sightseeing on the 21st (Sun) early enough to go by car to Wind Cave National Park. Wind Cave National Park presents one of the United States' few remaining intact prairies. On the 21st (Sun), Head underground at Wind Cave National Park and then take a memorable drive along Needles Highway. To see reviews, more things to do, traveler tips, and more tourist information, you can read our Wind Cave National Park tour planning website . You can drive from Keystone to Wind Cave National Park in 1.5 hours. July in Wind Cave National Park sees daily highs of 80°F and lows of 53°F at night. Cap off your sightseeing on the 21st (Sun) early enough to travel to Cody. Kick off your visit on the 22nd (Mon): get your game on at Cody Firearms Experience, LLC and then see the interesting displays at Buffalo Bill Center of the West. For more things to do, other places to visit, maps, and more tourist information, use the Cody trip maker . Traveling by car from Wind Cave National Park to Cody takes 7 hours. Alternatively, you can fly. In July, daily temperatures in Cody can reach 83°F, while at night they dip to 58°F. Cap off your sightseeing on the 23rd (Tue) early enough to go by car to Yellowstone National Park. 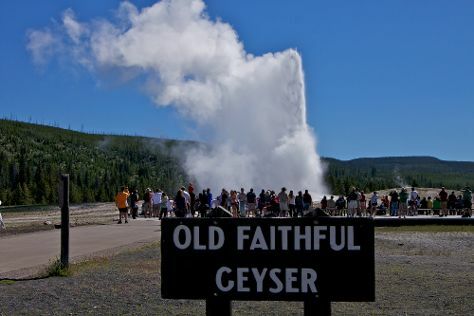 On the 23rd (Tue), take in the natural beauty of Old Faithful, trek along Artist Point, and then explore the stunning scenery at Grand Canyon of the Yellowstone. On the 24th (Wed), you'll have a packed day of sightseeing: take in the dramatic natural features at Lower Geyser Basin and then take in the natural beauty of Grand Prismatic Spring. To see reviews, other places to visit, ratings, and tourist information, read our Yellowstone National Park trip builder app . You can drive from Cody to Yellowstone National Park in 2.5 hours. Prepare for a bit cooler weather when traveling from Cody in July: high temperatures in Yellowstone National Park hover around 73°F and lows are around 39°F. Finish your sightseeing early on the 24th (Wed) so you can travel to Casper. Casper is a city in and the county seat of Natrona County, Wyoming, United States. To see where to stay, traveler tips, maps, and tourist information, go to the Casper vacation builder website . Explore your travel options from Yellowstone National Park to Casper with the Route module. Prepare for somewhat warmer weather when traveling from Yellowstone National Park in July: high temperatures in Casper hover around 89°F and lows are around 53°F. You will leave for home on the 25th (Thu).